Lemon Drizzle: Two heads are wetter than one? Two heads are wetter than one? Why, for Godsake, why? 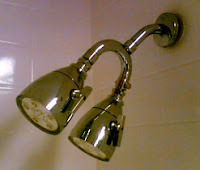 I can now vouch from firsthand experience that the basic process of sprinkling hot water onto the human form is in no way enhanced by having two showerheads, particularly when you can only change the angle of each jet by a fraction of a degree. You can just make out in this hastily shot picture that the whole thing was coming away from the wall - presumably where previous occupants had tried to adjust the jet direction by swivelling the whole thing (which only resulted in a fine cloud of tile grout and an ominous grinding noise when I tried it). Pointless reinvention. I asked a colleague who lives out that way if this was standard for LA bathrooms and he said 'no' - but then, with a raised eyebrow, suggested rakishly that it was for those occasions "when the shower would be shared"